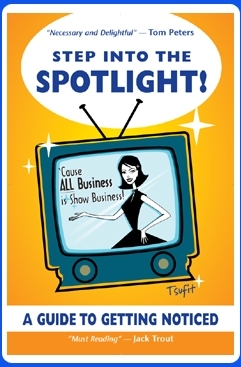 Tsufit, a lawyer-turned-comedy performer-turned-marketing consultant, lives in the “spotlight” herself and reveals her secret to attracting new clients as instinctively knowing that “ALL business is show business!”. Her book is really about sharing her own life, story, and experiences, and, in turn, helping business people release their own inner “star” power. Originally, I learned about Tsufit by taking one of her online webinars about how to write your own book and Step Into The Spotlight! through public speaking. I’m a fan. As a business person, with a background in comedy performance myself, it seemed like a natural fit and still does. She does an incredible job of “walking the talk” and being the living embodiment of what brand awareness can create, and continually manifest, through a personalized and entertaining approach. So, how do you step into the spotlight?